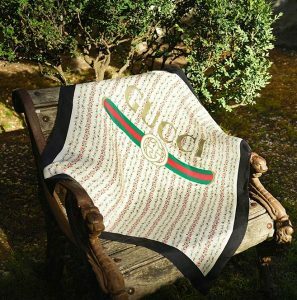 Let’s talk about the Gucci Cruise18 collection! Oh it’s very fetching! 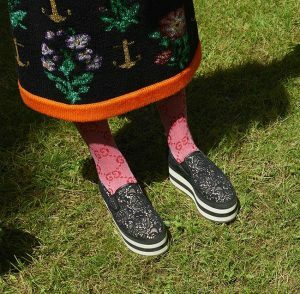 The accessories are colourful, arty, lush and plush featuring soft velvet clutches, bold backpacks and man bags, but there are also some retro pieces borrowing from past collections too. 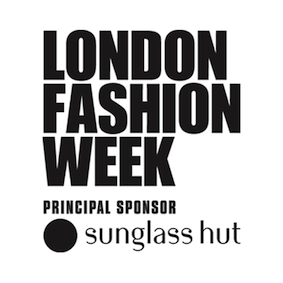 It is quite impressive and sees the fashion house picking inspirations and paying homage to designs from the 20s, 50s and 70s. Contemporary new men’s loafers have a thick rubber sole. 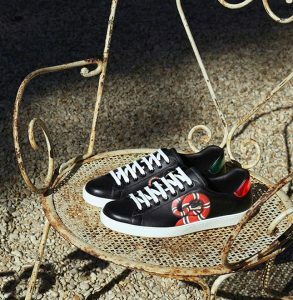 The retro design Gucci Ace sneaker features the King-snake print on the side. It also comes in another design set on a crystal embellished rubber platform. 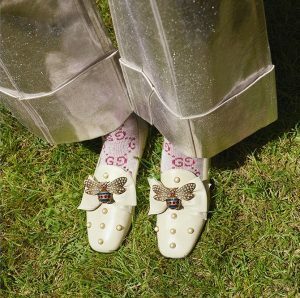 New pearl encrusted flats with large bows and bee detail – a design first introduced by the house in the 70s. 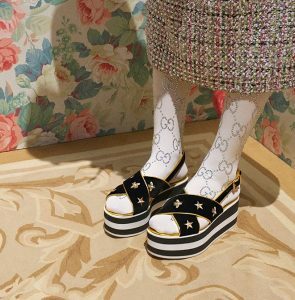 Platform sandals with the iconic bee symbol and star motif from the 70s designs and slip-on platforms with lace overlay on satin. 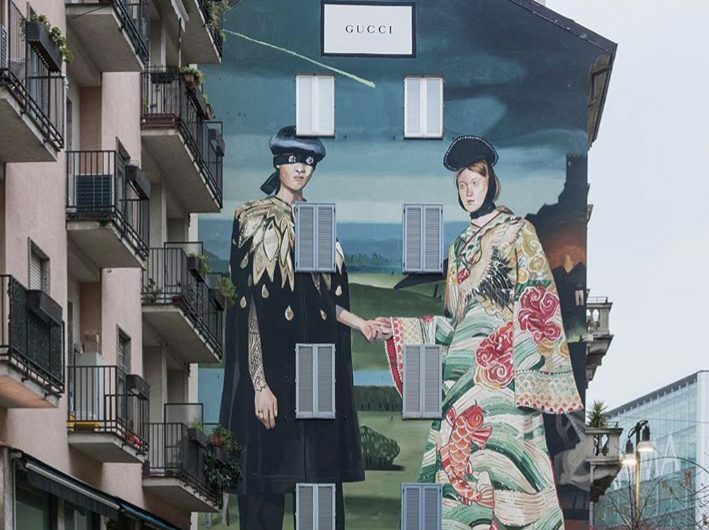 Eclectic and House motifs feature on silk scarves – which have been a canvas for the Gucci designs since the 20s. 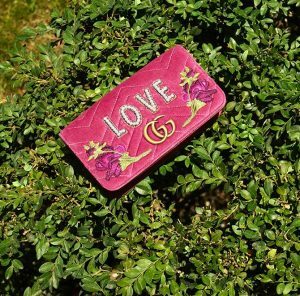 The new GG Marmont bag comes in soft velvet, has a structured shape with flap or sliding fastener with the GG hardware. 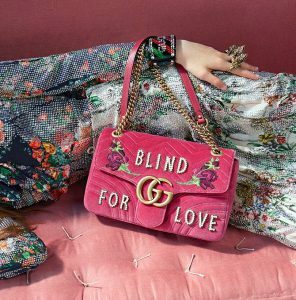 It has intricate rose embroidery and pearl appliqués spell out ‘Love’ – for the flap- and ‘Blind For Love’ – for the sliding fastener bag. Just beautiful! 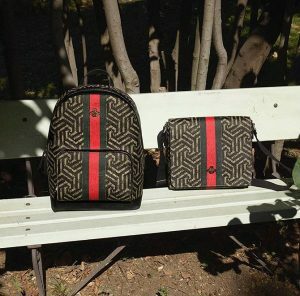 GG Caleido Print is seen on men’s backpacks and messenger bags – particularly love this print. So edgy! I mean we can go on and on. 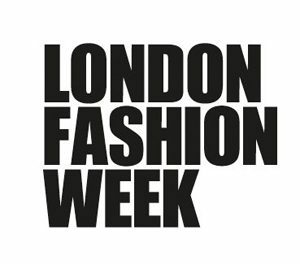 The collection is simply beautiful and there is something there to cater for all tastes; but still staying true to the brand. 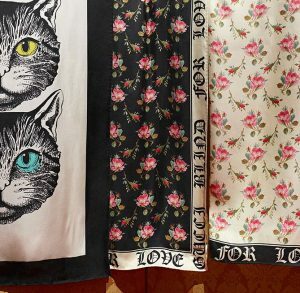 Hooray to Creative Director Alessandro Michele!!! 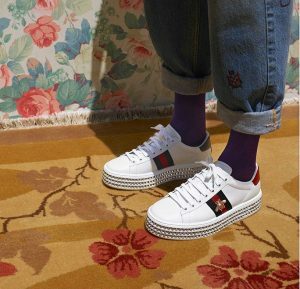 You can shop the above and more men’s and women’s pieces from the collection on the Gucci website.